Dr. William Schaffner, a noted authority on public health and infectious disease, frequently speaks on his field of expertise. William Schaffner, MD, a professor of medicine in the Division of Infectious Diseases and of preventive medicine in the Department of Health Policy for Vanderbilt University School of Medicine, has devoted his career to public health and disease prevention. A Yale graduate and Fulbright Scholar, he earned his medical degree from Cornell University and completed his fellowship in infectious disease at Vanderbilt before being commissioned in the U.S. Public Health Service as an epidemic intelligence service officer with the Centers for Disease Control and Prevention in Atlanta. After completing his tour of duty with the CDC, he returned to Nashville and the faculty of Vanderbilt. Schaffner, who sits on numerous national committees and is a current board member and past president of the National Foundation for Infectious Diseases, has become a 'go to' expert for national and international media outlets on a range of public health topics. Recently, during a break in a CDC meeting he was attending, Schaffner took time to speak with Medical News and share thoughts on his three top public health threats. "The crisis regarding opioid use and abuse ... that's got to be right at the top of the list," stated Schaffner. Opioid addiction and misuse have been well documented across all socioeconomic levels, ethnicities, religious beliefs and ages. While some areas of the country have been hit harder, no community has escaped the crisis. Statistics from the National Institute on Drug Abuse show just under 17,000 deaths from drug overdose in 1999. By 2017, that number had jumped to 70,237 with 47,600 of those overdose deaths involving opioids in some form. In addition to the immediate human toll caused by misuse, Schaffner said there are far-reaching consequences that are only beginning to be understood. Opiate addiction, he continued, has a wide range of downstream implications from family disruption to increasing a user's risk for an array of infectious diseases. The latter, he noted, has caused ethical dilemmas for providers and payers. In particular, Schaffner pointed to a spike in infective endocarditis, an infection of the interior heart lining, that has been attributed to opioid abuse. The heart infection can be treated with antibiotics or through surgery, depending on severity and response to medication. However, treatment is very expensive ... but failure to treat is fatal. Adding to the conundrum is the very real chance the infection could reoccur with continued drug use. "It's also true that many of these people don't have any insurance or insufficient insurance, and so this creates a financial stress on the institutions - the hospitals," Schaffner said of covering treatment options. "This has precipitated the creation of ethical committees who try to interact with the patients who are affected," he continued. Schaffner noted these committees have, in many cases, agreed to one surgical treatment if required ... but only one ... and that the patient must agree to go into a drug treatment program as a condition of having the surgery. Schaffner said these programs were created out of desperation and compassion, but "nobody has really had a chance, yet, to evaluate how successful the programs are." While Schaffner said there could be legitimate discussion points regarding vaccination laws, he noted scientifically debunked fears shouldn't be the driving force behind the anti-vax movement. "There is zero evidence that vaccines cause autism," he stated bluntly. Schaffner's lifelong work has focused on the prevention of infectious disease, including the effective use of vaccines in both pediatric and adult populations. A widely regarded expert on the subject, he has been a member of numerous advisory committees that have established national vaccine policies. "One of the discussion points has to do with compulsion ... the obligation that every child who goes to school or preschool has to be vaccinated," he said, adding that some people who believe in the effectiveness of vaccines have a problem with the 'compulsion' part of the process. However, he said, "Before we had these school immunization laws - with a full-court press on the part of pediatricians, family doctors and public health professionals - at a stretch, 70-72 percent (of children) were immunized. That left a quarter of all children unvaccinated." Schaffner continued, "After the laws, compliance was in excess of 90 percent." He added it takes a high compliance rate to eliminate a disease. In fact, he continued, vaccinations have historically been so effective in the United States that the country has become a victim of its own success. A significant number of parents of young children who refuse to vaccinate have never seen the true toll of measles, whooping cough or even chickenpox ... all of which can be deadly. "We need to do better telling these stories," said Schaffner. "It's become apparent we have to constantly educate." He pointed out vaccination laws come from states rather than the federal government and that all states have voted to enact some form of mandatory vaccines. With only Nebraska having a unicameral legislature, he continued, "That means the merits of school immunization laws had to be debated 99 times and voted on and then signed into law by governors ... and every state has it. This is a premier, elegant exercise in democracy." As for those who bristle against mandates on principle, Schaffner pointed out, "We've compelled people to go on the green and stop on the red." Sometimes, he said, rules have to be in place for the greater good, particularly when protecting those who cannot be vaccinated against infectious disease. "Today, we have so many children who are immunocompromised," he noted. "I believe all of us in a society have a responsibility not only to our own children but to those in our community who are too frail to be vaccinated. We have an obligation to protect them." Schaffner rounded out his top three public health threats with the growing issue of antibiotic resistance. "We're overusing antibiotics ... not only in medicine but in raising cattle, chickens and hogs," he said. "We have to be much more disciplined in our use of antibiotics wherever we're using them." 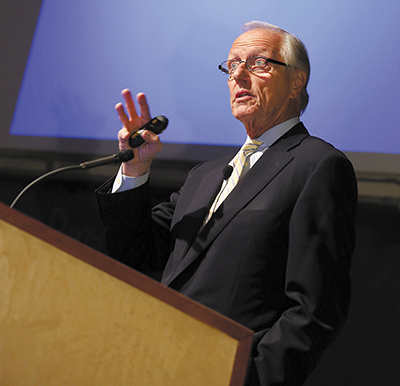 While medicine has been making efforts to curb overuse for two decades, Schaffner said the field still isn't where it needs to be. Doctors, he pointed out, are human, too. Sometimes it's easier to give in to the tenth demanding patient of the day. Instead, however, he asked prescribers to talk about symptom relief, which is really what patients want. "You have a viral infection rather than bacterial, but here's what we can do to help you feel better," he suggested of an approach. In light of the rise of 'super bugs,' Schaffner said curbing overuse is critical. "Slowly but surely, the main thing that's happened is our options have been restricted," he continued of trying to fight the increasing number of drug-resistant bacteria. While the healthcare community has direct actions that can be taken to address these top public health threats, including in-office education about vaccinations or limiting prescriptions for opioids and antibiotics, Schaffner said there is an even larger role to play. He pointed out providers have an authoritative voice and can share important insights outside the clinic setting. Even those who don't prescribe can speak up at a cocktail party or school event to correct misinformation. "Medical societies need to say, 'Yes, we'll get behind and support these public health efforts,'" he continued. Ultimately, Schaffner conclude, "We all have a potential to get involved."